Congratulations to MVP David Ortiz, to the Red Sox, and to the city of Boston on this World Series victory! 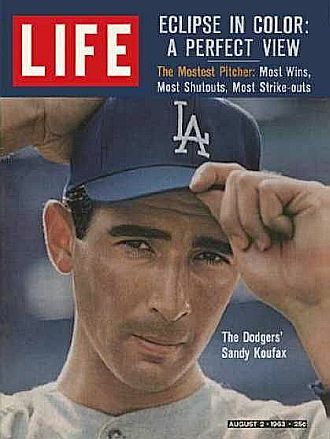 On 30 October 1963, Sandy Koufax was named the National League’s Most Valuable Player. Only six days prior, Koufax had also been unanimously voted as the winner of the Cy Young award. Pitching 40 games during the 1963 season, Koufax finished with a 25-5 record and a 1.88 ERA. He also went 2-0 in the World Series as the Los Angeles Dodgers swept the New York Yankees in four games. In Game 6 of the 1995 World Series, Atlanta Braves pitchers Tom Glavine and Mark Wohlers combined efforts to throw a one-hit shutout against the Cleveland Indians. The only run of the game came from David Justice’s lead-off home run in the sixth inning against Jim Poole. The 1-0 victory gave the Braves their first World Series championship since moving to Atlanta and, notably, the only World Series Championship of the 1990s Braves dynasty. One of my favorite television political and sports commentators is Keith Olbermann, who also happens to be a baseball junkie. A few nights ago, on his ESPN2 show “Olbermann” (original name, I know), he did a commentary on why baseball has experienced such a decline in viewership over the years. Blunt and direct, which is what I like about Olbermann. Still, the information he presents is rather sobering, isn’t it? How hard is it to hit a 95 MPH fastball? It’s definitely not easy, that’s for sure. Here’s a pretty sweet infographic from Phoenix Bats that breaks the process down for us. A player’s batting average is determined by dividing the number of base hits a player has by the total number of at-bats. For example, if a player has 500 at-bats and collects 150 hits in those at-bats, his batting average would be .300 (150/500 = .300). Keep in mind that walks and sacrifice plays (i.e. sacrifice bunts and sacrifice flies) do not count as at-bats, and therefore, do not factor into a player’s batting average. A batting average of .300 or above is considered an excellent batting average, and an average of .400 for a season is deemed nearly impossible. The last player to hit .400 for a season was Ted Williams, who finished the 1941 seasons with a .406 batting average.